In recent years, some restaurants around the United States have started banning certain ages of children or announcing that unruly children will not be tolerated. It really doesn’t bother me if a restaurant wants to do these things–it is their restaurant and people can choose to either patron it or not when it makes policies. What I do think, however, is that it is pretty sad that they even have to go there. I think it is sad that children are allowed to behave in public like that consistently enough that restaurants feel the need to do something about it. 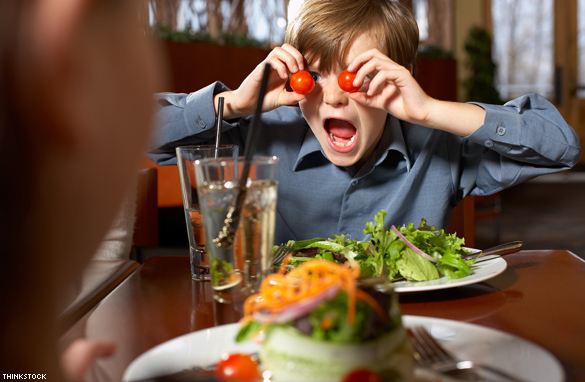 Sure, all kids have bad moments (see below), but there is obviously enough of a consistent problem with restaurant behavior that some restaurants are willing to anger parents of young children in order to appease other patrons. So how do you avoid your child from becoming the next one to inspire policy? Practice makes perfect. If there is nothing else you take away from this post, keep in mind the fact that practice makes perfect. This is true no matter what it is you are trying to instill in your child. Do you want your child to behave at the library? Practice at the library. Do you want your child to clean well? Practice cleaning. Do you want your child to be able to control his temper? Practice it. Do you want your child to have good restaurant manners? Practice! There are more steps here than simply practice. So now those of you with either more time or interest or longer attention spans, let’s get more involved. If you want your child to behave a certain way at a restaurant, the best place to teach those ways is not necessarily in the restaurant. The best place is going to be at home. This past summer, my girls and I enjoyed going to tea parties put on by a non-profit outdoor museum close to our home. The museum focuses on Western life in the late 1800s into the early 1900s. At the tea party, they started by teaching manners. They briefly taught things like where napkins went, how to say please, thank you, and no thank you, and to wait for the entire table to be served before you began eating. All of these little girls picked up on it very quickly and practiced it perfectly. So at home, explain and demonstrate what manners you want your child to display. Believe that your child is capable of great things. I was shocked McKenna could and would happily and patiently wait for everyone to be served when she had a plate full of treats in front of her. This was no small wait! But she did it with a smile on her face. Children rise to expectations. And keep in mind, if your child is not used to eating dinner at the dinner table at home, he isn’t going to know what expectations are when at a restaurant. Once you have explained your expectations, practice them at home at your meals. I don’t think you need to have exact replication of restaurant expectations at home in order to have success at the restaurant. I find children are smart enough to figure out that expectations are different in different settings. For example, many people have their children sit at the table for long durations at home so that they are used to it at restaurants. We don’t do that; our time at the dinner table at home is considerably shorter than it is in a restaurant and we have never had issues because of it (we frequently get compliments on how well-behaved our children are when we are at restaurants). Practice the manners that are important to you. It doesn’t need to be minute for minute practice, though. So instead of making the child sit at the table for 60 plus minutes, you can require the child to ask to leave the table before he leaves. Then at the restaurant, he will know he needs to ask before getting up from the table. One of the biggest needs at home in order to have good public behavior is good behavior at home. If you want your child to obey in public, you need to require obedience at home. Public is not a place that you have easy means for discipline–no matter what your discipline methods are. If you require obedience and are consistent at home, then you will have greater success out in public. Expect obedience and be consistent both at the dinner table and throughout the day. The next step is to practice in actual restaurants. I have written before on the topic The More You Do It, The More Your Child Will Get Used to It. This idea applies to restaurants just as much as anything else. However, I don’t want you to feel like it isn’t worth doing unless you can do it often. Some people eat out often and some only eat out on occasion–whether for financial, caloric, or principle reasons. You can still eat out with your children even if it is not a frequent event. Refer back to consistency and obedience at home. Have dinner together as a family and have rules and expectations at the table and your child will be smart enough to transfer those rules to restaurants. Choose a restaurant that is “kid friendly.” We have our restaurants that are kid friendly and those that we save for date night. I like to take my kids to restaurants that have a lot of background noise going on, not the ones where I can easily pick up on the conversation happening 20 feet across the room. Go prepared in a couple of ways. Way one is outlining expectations. This is a time to employ Ask and Tell (follow the link for details). Before you leave your house or before you exit the car, remind your children of what is appropriate in the restaurant. Go through the lists of what cannot and what must be done. Do a little pop quiz afterward to be sure they were listening. Your next step in preparation is to have a battle plan in place between you and your spouse. What will you do if a rule is broken? There is no one right answer here. Initially, I think reminders are fine. But there are times a child will be out of control (and I don’t mean completely out of control, but to a point you feel like action needs to be taken)–at those times, what will you do? Will one of you take the child to the car? Is there a place in the restaurant you could go to talk about the behavior? Have a plan in place so you aren’t putting yourself in a situation where you find yourself willing to do anything to make the child happy so you aren’t disturbing the peace. You don’t want to be in that situation! You don’t want to end up rewarding negative behavior. The final step in preparation is to bring along whatever you need (and is reasonable) to make the dinner enjoyable. I find this applies mostly to toddlers and babies. Do you need to bring a sippy cup? Do you need to bring some food for your pre-toddler to eat? Do you need some things to entertain the child with? When you sit down and order food, you have a long time (for a child) before food arrives, so be ready to do some distracting and entertaining. Be smart about the time of day you go. A child is not going to be on great behavior if you go during nap time or at bed time. He also won’t be on great behavior if he is extremely hungry. If you can get to the restaurant before or by 6 PM, you will be in and out much faster than if you are in the late 6 PM hour or later. If you must go later, try to make a reservation. Some days are just bad days for kids. Your child might typically be quite good and obedient and then just be super hyper that night. Know bad days will happen. Employ your plan you made for handling the situation, but laugh it off. It doesn’t mean your child is going to grow up to be a bank robber and it doesn’t mean you have to limit restaurant experiences to date night. It means your child is a human being who had a bad day. We all have them. Even the best behaved kids have bad moments. The long-term ramifications lie in how that situation is handled, not in that the situation happened. Take it Slowly. A little tip–don’t feed the baby, pre-toddler, or toddler before you even get your food. Then your child will be long done before you even get your food. Try entertaining with coloring or small, quiet toys or games before the food comes. We have also found that for McKenna, getting her a fun drink at the end of the meal will keep her busy and content while we finish out our meal. Similarly, I bring some little snacks Brinley likes so if she is done eating I can slip her some snacks and keep her interested for a while longer. Get it Cheap. Another tip–many restaurants have “kids eat free” nights, so find out when those are so you can make the visit more affordable for your family. You can ask around or just call the restaurants you like to go to and find out if any of them are free that night. Do you have tips for restaurants?